A few hours aboard the new Amels Imagine proves that it is possible to get close to a goal that is elusive, even in the realm of superyachts and superlatives—flawlessness. 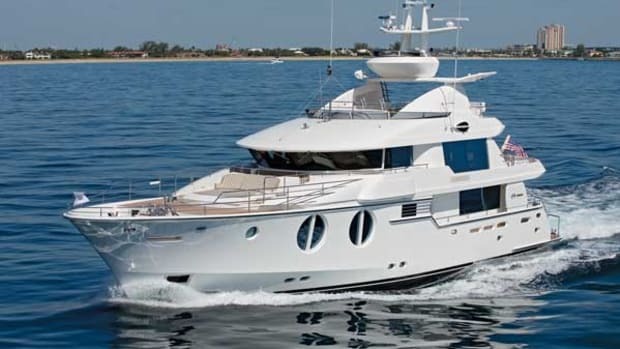 She is a yacht with great credentials and features that make life on board wonderful. 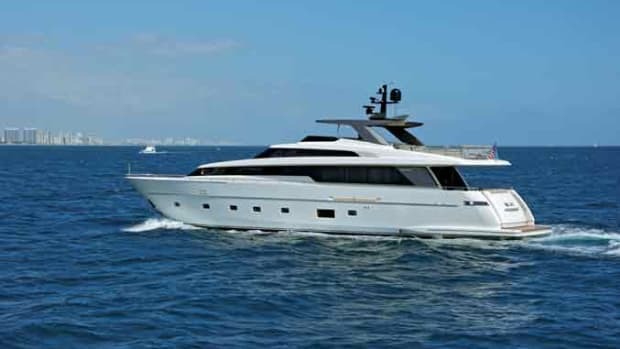 Imagine debuts at the Monaco Yacht Show. Imagine’s stylish Yachtwerft Meyer tender spins around the new reigning queen of the Amels Limited Editions in an approach perfectly choreographed for full effect. It gives me time to take it all in: her nice lines, perfect gray hull paint and gleaming white superstructure. The first impression I get from Imagine is that for a 1,503 gross- ton yacht, she is quite elegant, lean and pleasantly restrained in her styling. She owes her good looks to designer Tim Heywood, who has worked with Amels on the 171, 177, 199 and 212 Amels Limited Editions models. I ascend the few easy steps leading to the aft deck, where crewmembers offer silver trays of golden champagne—a nice way to break the ice. The aft deck is perfect for entertaining small or large groups and it does not take long for a small circle to form by the salon entrance, chatting amiably, champagne flutes in hand. I take a peek through the glass doors surrounding the dining room, which is, unusually, the first room you encounter when entering from the aft deck. Jim Dixon, associate director of Andrew Winch Designs and a fine-furniture designer, created the custom table in carved wengé, which stands very well on its own as a decorative piece between the exterior and interior spaces. It is a clever idea to have the dining room here, as it opens up more space for the living area. Imagine’s salon looks like it belongs in an elegant home, with its Bechstein Grand Piano, upholstered sofas and chairs, stylish coffee tables and wide passageways. Big windows with eucalyptus shutters and fabric blinds, stitched faux-leather ceiling, parquet flooring (a combination of jatoba hardwood and wengé), crushed copper and mother-of-pearl accents, a backlit alabaster bas-relief and a hand-picked antique Persian rug all work in concert to create an elegant yet approachable space. The highly customized interior owes its modern sophistication to Andrew Winch Designs in close collaboration with the owners’ representative, Yavor Nenov. An important amendment one of the owners made to the planned design was to use copper instead of stainless steel for nearly all interior fixtures, including light-bulb casings. This seemingly minute detail helps the overhead lights cast a pleasant glow that softens the décor. It is abundantly clear by now, even without looking further, that Imagine strikes a great balance between engineering and creativity. Countless details went into making her what she is—a luxurious vessel able to entertain while safely and comfortably taking guests to faraway places or, if they prefer, enjoying a secluded anchorage. Hull No. 1 of the 212 Limited Edition Series gets high marks during a cruise along the Palma coast, gliding effortlessly at 13 to 14 knots through a moderately choppy Mediterranean sea. The 20- to 25-knot winds are barely noticeable. 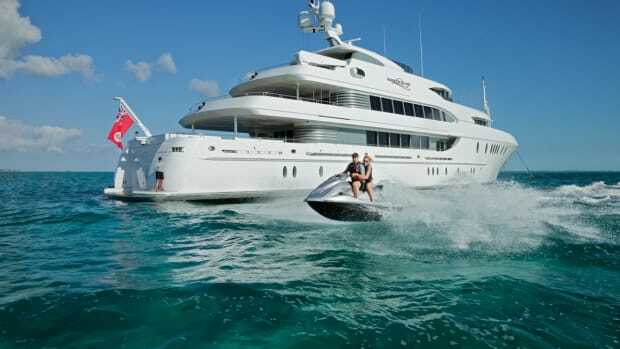 Consumption at 13 knots is about 185 gallons an hour (about 317 gph at the 17-knot top speed). As part of Damen Shipyards, a shipbuilding conglomerate with more than 5,000 vessels to its credit, Amels has access to extensive resources in terms of naval architecture. 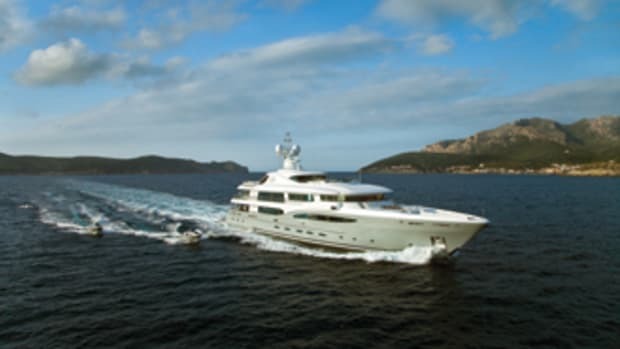 As a basis it chose the already proven hull it used for the custom-built Amels My Shanti (now Aquarius) delivered in 2007. Four fin stabilizers work in conjunction with the optimized full-displacement steel hull (no bulb) to provide a steady ride. The Quantum stabilizers also work at anchor. 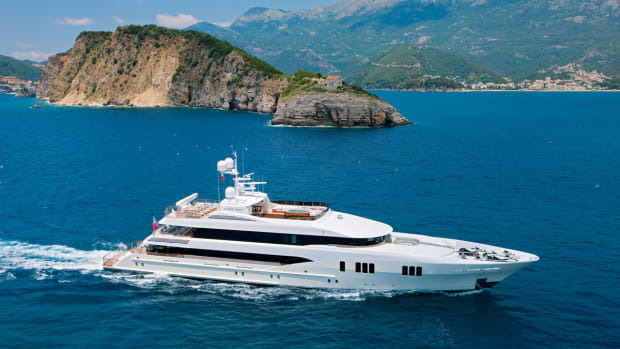 The yacht drops anchor off a secluded beach long enough for us to enjoy a multi-course lunch expertly prepared by the yacht’s Neapolitan chef, Tiziano Nastri. While the tender gently bobs along the swim platform with the current, the yacht stays impressively still. The side glass panels protect us from the wind without spoiling the panorama. They are welcome additions on that breezy and occasionally drizzly March day. Noise and vibration are other big comfort spoilers, and air conditioning can be a big contributor in that category. Imagine features an efficient and quiet climate system by Heinen & Hopman. And, in order to further help regulate ambient temperature, the shipyard used specially treated double-pane glass (covered with an anti-UV metal-based film) for all windows. Two VIP suites on the bridge deck feature full-length windows so that their occupants can step out on to a small balcony to enjoy the ocean breeze. Holland-based consultant Art Unlimited helped the owners select and place the art, which includes paintings, prints and photos, mostly from contemporary artists. These pieces add drama, color and a fun element. An interactive piece by rAndom International—featuring mirrored OLEDs (organic light emitting diodes) that react to an electrical current—engages everyone. There is also a photo of Yoko Ono and John Lennon composing the song that gave the yacht her name. As comfortable and attractive as the yacht’s interior is, the decks offer many compelling reasons to step outdoors. 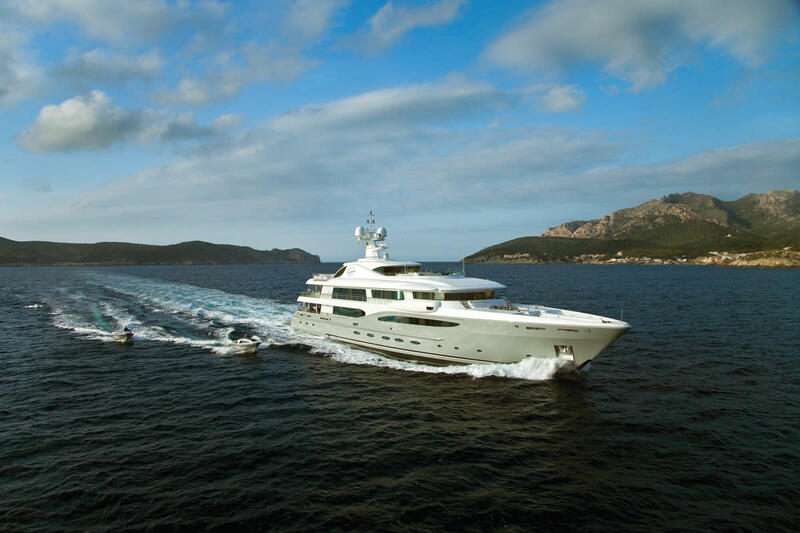 Designer Tim Heywood added signature curves to the topsides of the superstructure. Similar ones are evident on other Tim Heywood-designed yachts, but here they are more than cosmetic, delineating two lovely alcoves. The owners’ project manager was so fond of these quiet nests, ideal for contemplation or reading, he suggested to take them a step further, with the addition of an eye-shaped window, so you can curl up on the terry cloth-covered mattress and watch the waves streaming alongside the hull. 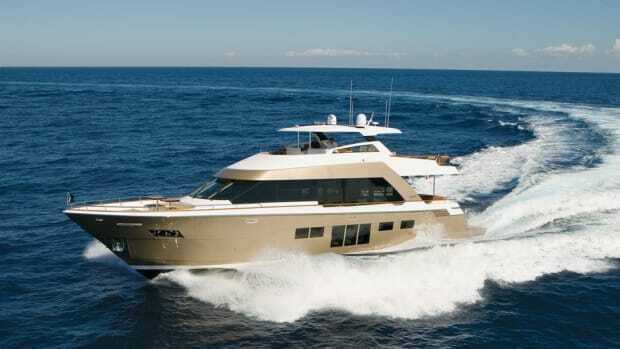 The pool with swim-up bar on the foredeck area and the Jacuzzi in its nest of sun pads invite more social gatherings. The deep pool is able to drain in three minutes (a Lloyd’s requirement). Side-view windows, opening onto the top-floor landing and the side of the pool, add a playful touch. There is also a gym with great views. Another dining room is located there under the radar arch. The spacious aft deck is reserved for sunbathing with a huge comfortable striped sun bed and lounge chairs. When stowed out of the way, they make room for an optional touch-and-go helipad. 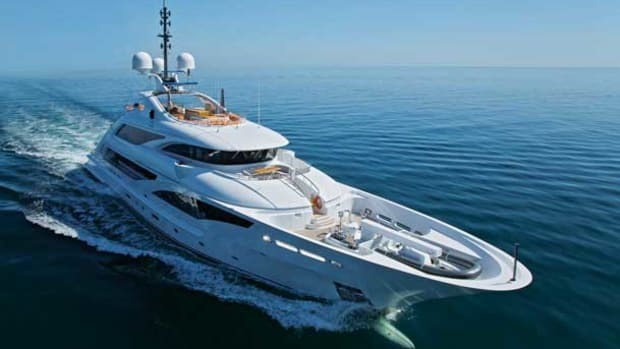 Few guests will ever enter the yacht’s crew and technical areas, yet they are very important. Happy crew, happy guests, they say, and functionality is a major requirement for trouble-free cruises. The garage is spacious with side doors and built-in cranes to haul and deploy the tenders. The two-level engine room is meticulously organized around two Caterpillar engines and feature a soundproof engineer room. The impeccable galley is nothing flashy but features ample prep and storage space and top-of-the-line stainless-steel appliances to steam, fry, bake or roast. The crew has a comfortable mess for meals and nicely appointed and easy-to-maintain cabins. The laundry room will be able to handle a great load of towels and sheets all at once. One area guests will probably end up visiting frequently is the bridge where we spoke with Captain Grahame Shorrocks, a Scotsman by birth who has spent 25 years of his career in yachting, 16 years as a captain. The bridge is a great place from which to enjoy navigation through vertical windows. The black leather-upholstered banquette, behind the leaning post, is comfortable and easily accessible. Instead of the somewhat intrusive table partially blocking access to the banquette, there is a smaller adjustable table and armrests with built-in cup holders. A walkaround integrated bridge is clutter-free with five easy-to-view screens. Just out of the sturdy doors are the side-wing stations. Capt. Shorrocks stepped outside and maneuvered the ship expertly to line up with the docks in Palma de Mallorca’s Club de Mar, as easily as if this were a boat half her size. 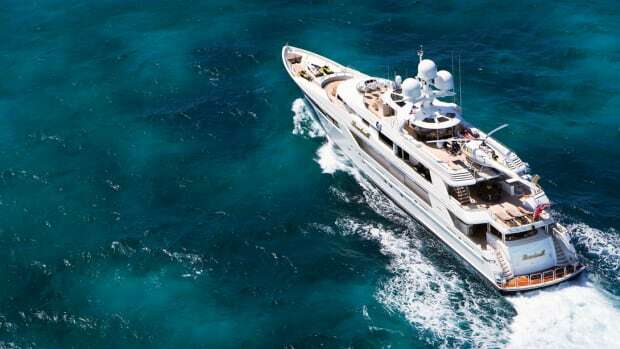 Years of experience helped no doubt, but so did the yacht’s in-line Voith thruster/propeller (an axle-free, electrically driven propeller), which quietly assists in moving the yacht sideways. This yacht has two owners—business partners—but one cohesive and elegant interior, which will appeal to many. The yacht was delivered early and with only five items to revisit on the checklist. Four were fixed within no time and the fifth was an owners’ change request, Nenov said. 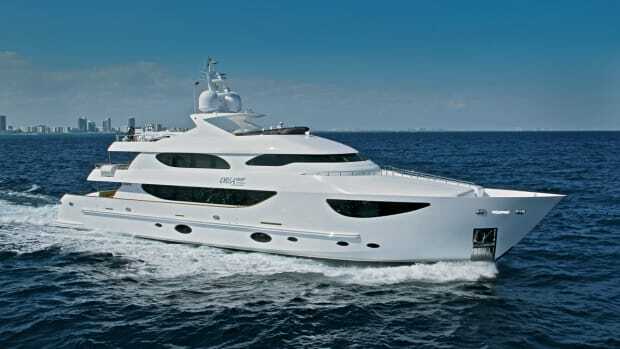 For more information, visit amels-holland.com, or for charter information, fraseryachts.com.